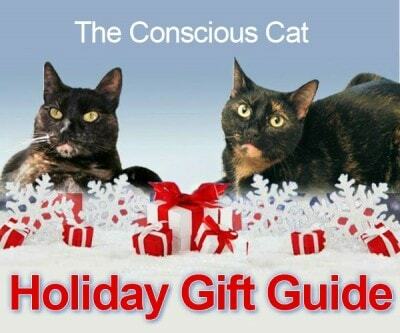 Welcome to The Conscious Cat 2014 Holiday Gift Guide – your one stop shopping solution for all the cats and cat lovers on your holiday gift list! This year’s guide is bigger and better than ever before. 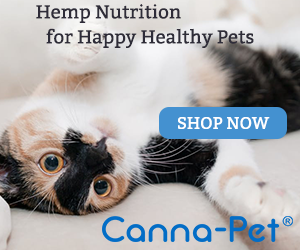 It not only features some of the best products for cats and cat lovers on the market, many of the companies featured are offering exclusive discounts to Conscious Cat readers. You’ll find gifts ranging from cat furniture to toys to art to products for your home as well as some gift ideas you may not have thought of. I can guarantee you that you’ll find something to delight every kitty and every cat lover in your life. And by buying these products, you’ll not only get some really wonderful gifts, you’ll also support small businesses, many of them run out of the owners’ homes. So grab a cup of your favorite holiday beverage, and sit back and enjoy browsing our Holiday Gift Guide. To go to a specific category, simply click on that link. The guide is best browsed with a cat or two on your lap. FTC Disclosure: This is a sponsored post, which means that the businesses featured in this post paid me an advertising fee. Regardless of payment received, you will never see products or services featured on this site that I don’t either use or would use myself. 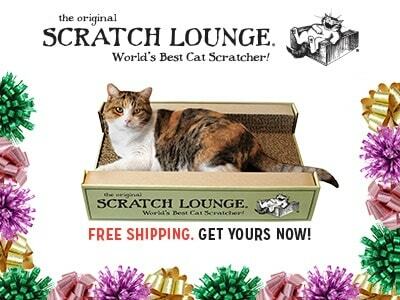 Scratch Lounge revolutionizes cat-scratch technology with it’s 3-sided scratcher. 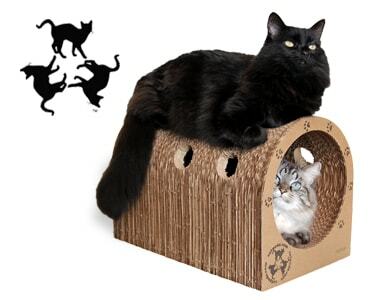 Our scratcher features an extra large surface area for all sizes of cats while allowing them to satisfy their scratching and instinctual need to nest. The Original Scratch Lounge will last longer because of the reversible super-dense honeycomb construction of the cardboard pads. This year we introduced the new blue Scratch Lounge with the same scratching surface as the Original but lower price, it makes the perfect gift for kitties. Visit http://www.ScratchLounge.com for more information and to purchase. Looking for the best cat toy gifts for your cat this holiday season? Pets Can Play’s higher quality Bird Catcher series of cat feather wand toys are only available on Amazon (US only) and they sell out every year! Cat are just plain addicted to those flying feathers and you’ll have so much fun watching them during playtime sessions! Watch them go from predatory stealth mode to dash and attack mode. 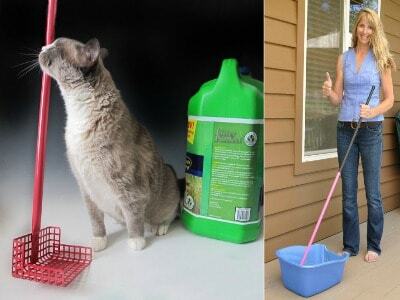 Great exercise for lazy cats, highly recommended by veterinarians to improve their health, and a great way for cat guardians to bond with their cats. Buy them for your feline friend(s) and also consider getting these quality feather wand toy for your cat lover friends as well! Hurry! Order early before they sell out! We cannot guarantee inventory during the holiday season! 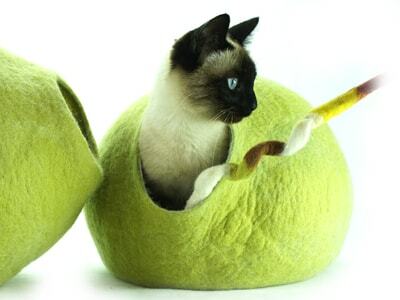 Kivikis cat beds are modern, beautifully designed cat caves. Hand felted from natural, ecological sheep wool, these cat houses are perfect for cats to play and sleep inside or on top. This comfortable bed provides maximum warmth and comfort for your cat’s healthy sleeping and rest. Cozy, cushioned and super soft and warm, your cat will feel happy when in it. These beds are simple but good-looking. Visit http://www.Kivikis.com for more information and to purchase. Exclusive discount for Conscious Cat readers: 10 Euros off and free shipping (discount valid from September 1, 2014 through February 1, 2015). Use code kivikis.cat at checkout. Neko Birbug and the Telescoping Rod with it’s unique design and high quality craftsmanship set this interactive wand toy apart from all others. You can choose how you want to play and open up to a world of limitless playing styles with your feline friend. The rod is also Interchangeable with other Neko flies toys! Visit http://www.NekoFlies.com for more information and to purchase. Exclusive 10% discount for Conscious Cat readers November 23-30 only. Use code 2014CCFL at check out. The Cat Crib is a unique new bed for your kitties. 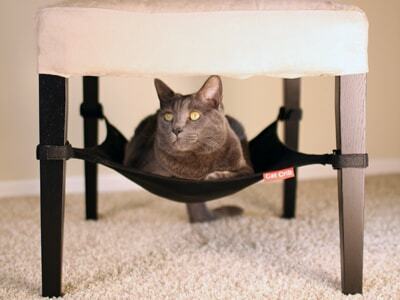 It is an internationally recognized and award winning cat hammock that attaches to your chair or end table. The Cat Crib’s patented design has no-slip straps that wrap securely around the chair legs and provide a hideout for your cat to sleep in. Cat’s love lounging in the hammock and are attracted to the hideout it provides. The fleece sleeping area cradles them to sleep while they remain covered and safe underneath the chair. The Cat Crib cat hammock comes in three colors of Neutral, Black, and Purple and is machine washable. The Cat Crib has been tested to hold 20 lbs – large kitties aren’t left out! You can see photos of satisfied cat-stomers at Cat Crib’s Pinterest page. Exclusive 15% discount for Conscious Cat readers on all orders, visit http://www.CatCrib.com to purchase and use from , use code ConsciousCat15 at checkout. Is your cat fun? Then why not give her something fun to sleep in? Inspired by the Googie style of architecture (think 1950s coffee shops with their curvy signs and boomerang patterns on the countertops), the Googie Cat Bed celebrates the spirited optimism of postwar America. With its two bold amoeba-shaped walls, this cat bed will make you smile every time to look at it. It’s also super comfortable. Sheathed in carpet made of 100% post consumer recycled bottles and padded inside, the Googie Cat Bed adds fun to both your home and your cat’s day. Available in three color/pattern combinations. For more information and to purchase, visit http://www.DaviesDecor.com. 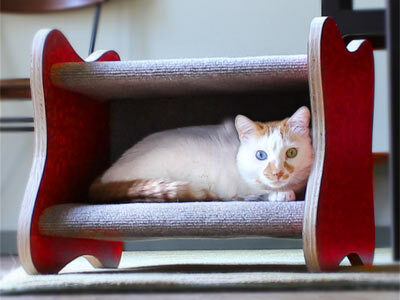 Holiday discount: free shipping on all Googie Cat Bed orders received before December 31, 2014. Cannot be used in conjunction with other coupons. Limited to one use per customer. Use code googieholiday at checkout. 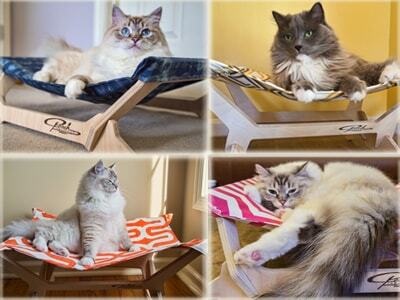 Inspired by a commitment to style, safety, and sustainability, the Peach Industries’ Kitty Loungers are chic, modern hammocks that cats just cannot resist. Each hammock is made in the USA using the highest quality, 100% USA sourced materials. From the VOC-free birch plywood to the finely woven, machine washable cotton, each element of our Kitty Loungers has been carefully selected to please the most discerning of felines. For more information and to purchase, visit http://www.PeachIndustries.com. Both codes can be used on the same order. Discounts are valid November 1 through December 31, 2014. The Paca Pet Pouf by Sugarboy’s is a unique handmade pet bed and quite possibly the best bed your feline companion can have! These beds were inspired by the creator’s three cats, Poni, Beemer and Mowgli, who discovered the fabulous plush qualities of alpaca while she was sorting fiber. Alpaca provides ultimate luxury and comfort year round; lightweight fibers that are five times warmer than wool; and, air pockets that possess cooling properties in the summer. The Pouf is machine washable provided you have a wool setting on a front-load washer. You can also hand soak and machine spin, then air dry, or, use the top rack of the dishwasher on a delicate or top rack only setting, then air dry. For more information and to purchase, visit Sugarboy’s Etsy Shop. Exclusive 10% discount for Conscious Cat readers. Minimum purchase of $6. Applies to any item in the shop. Offer valid through January 31, 2015. Applies only to items in stock at Sugarboy’s Esty shop; not applicable to custom orders. Use code ConsciousCat1014 at checkout. Do you have a cardboard lover in your house that shreds right through them? Original Catpods were created just for them. Extremely durable and eco-friendly scratchers built to last for years. They’re also a crouching spot, zooming tunnel, quiet retreat space for naps, and a great playtime toy. Features three curiosity inducing peepholes on either side, perfect for multiple cat play. A stylish way to satisfy your cat’s scratching needs, while providing a long lasting perch of their own. Handcrafted in the USA with safe non-toxic materials, and 100% recyclable. Visit http://www.Catpods.com for more information and to purchase. Exclusive 10% discount for Conscious Cat readers: good on anything in the store, no expiration date. Use code CONSCIOUSCAT on checkout. 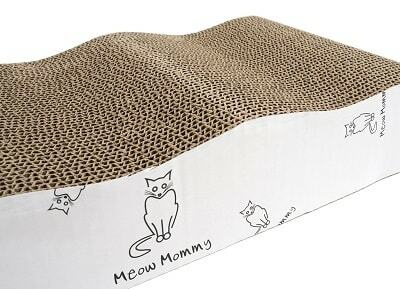 The wave shape of The Meow Mommy scratcher is perfect for cats of all sizes, but more importantly, lets your cat still achieve that full body stretch that’s so important. And because when it comes to scratching, the words “delicate” and ‘gentle” don’t really apply we made our awesome scratcher out of heavy-duty, super dense, corrugated cardboard that’s a solid 3” thick meaning it’s going to last way longer saving you time and money in replacements. When your scratcher does (finally) need replacement though, you can feel good about letting it go back into the environment, because The Meow Mommy scratcher is not only 100% recyclable, but it’s compostable too! Get 20% off this season using the code “CATBELLS”- exclusive to Conscious Cat readers. Available from Amazon. 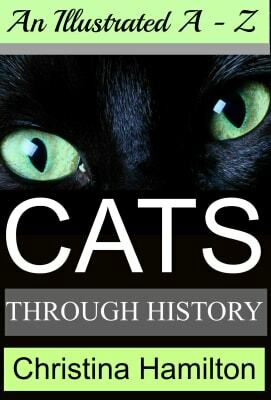 Exclusive 20% discount for Conscious Cat readers: use code CATBELLS at checkout. The Sleepypod is more than a pet bed, more than a carrier or car seat. It’s your pet’s personal space, designed to fit his or her needs. Sleepypod pampers your pet in luxurious ultra plush foam, providing comfort and security. In times of fear and stress, the dome top can be closed by unzipping the center and adjusting the sides. An extra warmer is available for extra coziness on chilly nights or when a human lap just isn’t available. Available in six vibrant colors to match any personality. For more information and to purchase, visit http://www.Sleepypod.com. Special 10% discount for Conscious Cat readers: Use code CCHG2014 at checkout. Discount expires December 31, 2014. 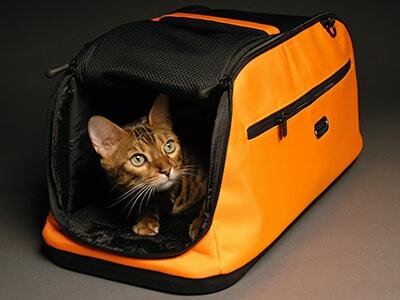 The Sleepypod Air is the only airline approved cat carrier that redefines in-cabin pet travel. Air adapts to the various under seat storage requirements set by different airlines while providing maximum comfort for your jet set pet. The plush cover on the removable foam bed is machine washable. The coated exterior and interior fabric is easily washed with a damp cloth. For more information and to purchase, visit http://www.Sleepypod.com. Need a gift for a cat lover friend? Or want to add to your own cat collection or decor? Georgia’s Gifts is the online store for you! 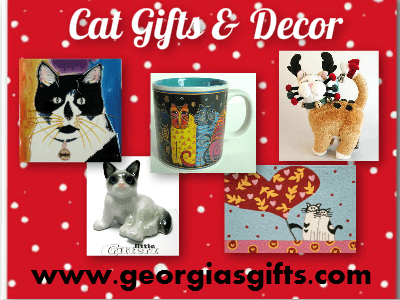 At Georgia’s they search for the best in whimsical, unique, cat themed gifts, decor and fashion accessories. Their extensive selection includes ceramic & plush cats, miniature porcelain figurines, kitchen linens & decor, ceramic tiles, home & garden decor, and sleepwear. Plus they feature the colorful cat items from Laurel Burch, including handbags, scarves, tablet covers, mugs and more. They have something for every occasion and every budget. Visit http://www.GeorgiasGifts.com today and find that “purrfect” gift! Exclusive 10% discount for Conscious Cat readers: Use promo code CAT10 at checkout. Offer good through November 30, 2014, cannot be combined with other offers. Imagine your loved one’s face lighting up when the gift you’ve given and they see the face of a beloved pet or person captured in a unique portrait drawing. Wouldn’t you like to be the one to give a completely one of a kind gift this year? Michelle Wolff would love to help you choose a special gift that can’t be replicated by anyone! Whether a custom drawing or an order of prints, cards or canvas reproductions of my original artwork, it’s quite likely that the receiver of your thoughtfulness will be truly delighted! For more information, please visit Michelle Wolff’s website. 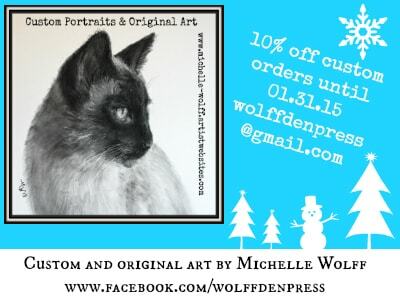 Exclusive 10% discount for Conscious Cat readers on any custom orders placed by January 1, 2015 by contacting Michelle Wolff for details. If you prefer prints please enjoy 10% off your purchase price through January 31, 2015 by entering code EJZJCT at checkout. 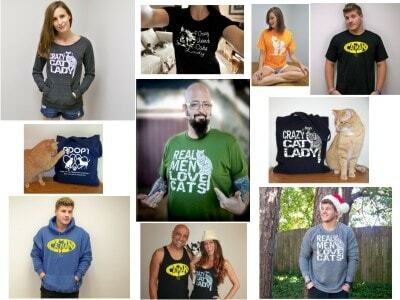 The shirts shown above are just a sample of what you’ll find at RCTees, the perfect place to find that special something for the cat or dog lover in your life. You’ll find original animal themed designs created and printed by husband and wife team, Mark and Toni Nicholson. The cat and dog designs are inspired by Mark and Toni’s two rescues, Abby and Roxanne. Each piece is hand screened by Mark as ordered, making it unique and ensuring top quality. For more information and to purchase, please visit the RC Tees Etsy Shop. Exclusive 10% discount for Conscious Cat readers: Use code CONSCIOUSCAT10 at checkout. Discount valid through the holidays. The cat lovers in your life will love this darling Sledding Cat sweater. Kitty is wearing his own red holiday sweater and has a Santa hat with fluffy accents. This happy blue eyed cat is enjoying the winter wonderland weather, riding a candy cane striped sled. Quality 100% cotton knit in sizes XS-XXL, $49.99. 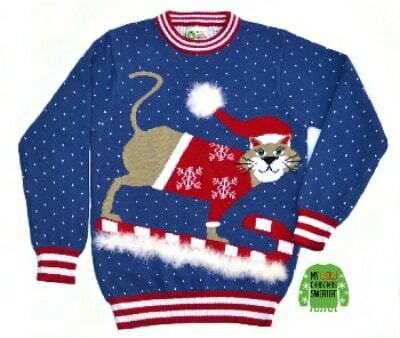 For more information and to purchase, visit http://www.MyUglyChristmasSweater.com. Exclusive 15% discount for Conscious Cat readers: Use code consciouscat15 at checkout. Discount good through December 15, 2014. Bernadette Kazmarski has been “making stuff” since she could hold things in her hands. Under the close and careful supervision of her feline family she sketches and paints her own cats and commissioned portraits of others’ pets, and uses those images on gift items such as keepsake boxes and wall art, hand printed table-coverings and garden flags. She also carries a large variety of feline-themed greeting cards and note cards for animal sympathy, Valentine’s Day and Christmas, Hanukkah and other winter holidays. 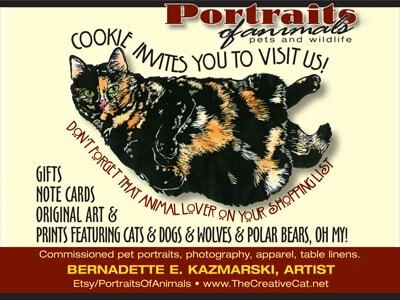 What’s available changes all the time so visit and browse Portraits of Animals on Etsy for a unique gift. Anji Martin is a wedding and portrait photographer who serves the D.C. metro area. Last year, she decided to expand my portfolio to include something that I, as a cat owner, am passionate about. Namely cat photography! When asked why she became a professional photographer, Anji says it’s because she believes that everyone, human or cat, deserves to have pictures of themselves that they can look back and smile at 5,10, 20 years or even a lifetime later! Anji’s journey taking pictures started at a young age when her father, who was tired of sharing his camera with her, bought her her own for her 5th birthday. She got her first professional-quality camera in 2006, and has since fallen in love with photography all over again. Anji got a degree from the New York Institute of Photography in 2012 and has been a member of Professional Photographers of America since early 2014. 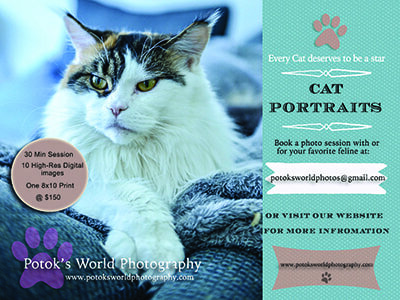 For more information, visit http://www.PotoksWorldPhotography.com. Special discount for Conscious Cat readers: 10% off. Contact Anji Martin and mention code PWPHOLIDAY2014 in their correspondence. Offer expires December 31, 2014. 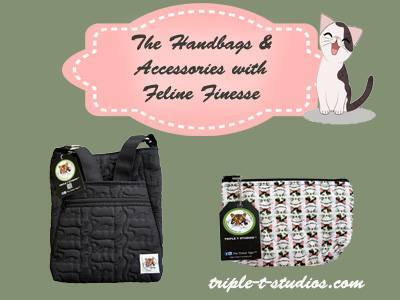 Triple T Studios creates uniquely designed handbags and accessories sure to please any cat lover. The handbags have feline finesse quilted into the sleek black fabric creating a subtle yet cool cat appearance. The irresistible design combined with the hands free practicality of the cross-body Hipster make this the perfect bag when you are on the prowl. The Gracey accessory line features a cute kitten face microfiber pattern with diamond quilting sure to bring a smile to your face. All handbags and accessories are Made in the USA and are Vegan Friendly. For more information and to purchase, visit http://www.triple-t-studios.com. Free Shipping to for Conscious Cat readers: Use code CONSCIOUS CAT at checkout. Good while supplies last. 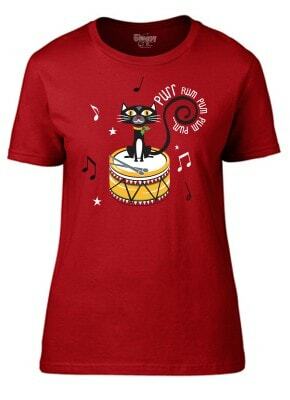 Have a Meowy Christmas with a comfy Purr Rum Pum Pum Pum tee from Shaggy Chic! Gift cards available. Proceeds benefit Don’t Forget to Feed Me, a non-profit pet food bank. For more information and to purchase, visit http://www.ShaggyChicApparel.com. Special discount for Conscious Cat readers: 25% discount on all orders, including the Purr Rum Pum Pum Pum tee, when using the code KITTY through December 31. PetGiftBox.com is a subscription box company for the four legged loves of your life . Their goals is to to bring you a monthly box filled with the best, brightest, funniest, newest, most delicious and exciting surprises to pamper your pets each month. They fill each box personally with carefully curated items. Each month you will receive the coolest and newest products and all-natural treats. Plus, they are unleashed – no long term contracts or hidden fees. 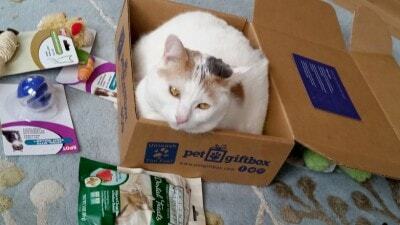 Pet Gift Box is your pet’s new best friend. For more information and to purchase, visit http://www.PetGiftBox.com. Special discount for Conscious Cat readers: : 25% off your first box. Use code consciouscat25 at checkout. Code will expire December 31, 2014. 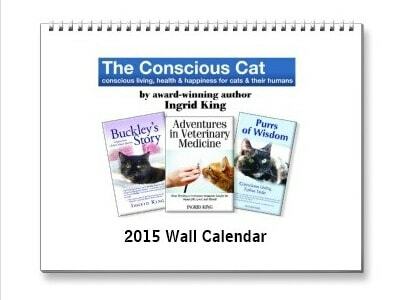 It’s back by popular demand: The 2015 Conscious Cat Wall Calendar is now available for purchase! So many of you told me last year that you loved the calendar, and we think we made this year’s even better. Allegra and Ruby spent hours picking out just the right photos, and they made sure that they received equal representation. To my knowledge, this is still the only calendar on the market that exclusively features tortoiseshell cats. Click here for more information and to purchase. The Litter-Lifter® range of cat litter scoops are the quickest and easiest solution to picking up waste. The No-Sift™, peaked blades lift out ONLY the waste, leaving clean litter in the box where it belongs. 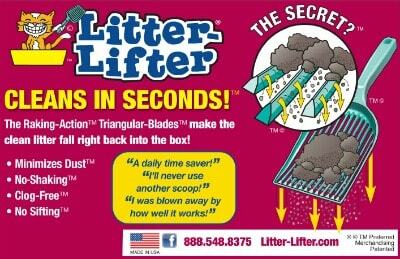 Litter-Lifters™ even pick up waste fragments and create virtually no dust because there is no need to shake the clean litter free – it falls through the specially designed triangular blades. Tapered scoop makes a strong scraper for heavier messes. Available in up to 14 colors both online and from many retailers. Visit http://www.Litter-Lifter.com for more information. The Critterzone is a powerful air naturalizer in a deceptively small package. This little unit gets the job done. Effective even on the toughest odors, including urine soaked carpeting, this air product will get to work as soon as you plug it in, cleaning up any unpleasant odors in your home. With the Critterzone, litter box odors will be a thing of the past. For more information and to purchase, visit http://www.CritterzoneUSA.com. 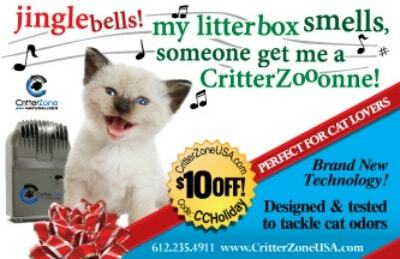 Exclusive discount for Conscious Cat readers: Get $10 off every Critterzone unit. Use code CCHOLIDAY at check out. The CarPET Scratch Stopper is the first effective device ever created to stop cats from scratching the carpet at doorways, instantly. The product’s unique, patent-pending design is specifically tailor shaped to fit within U.S. standard 28”, 30” and 32” interior doorways, effectively protecting the most commonly targeted cat scratch areas. The CarPET Scratch Stopper is easy to use, simply place in doorway. 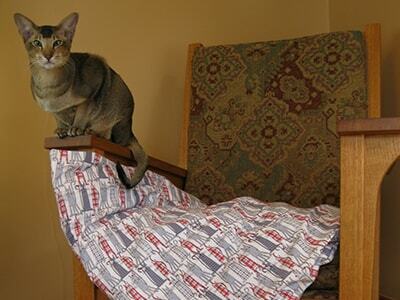 It is safe for cats & carpets, saves $$$ on carpet replacement/repair, and helps prevent declawing. Durable & long lasting, this product is guaranteed to work or your money back. 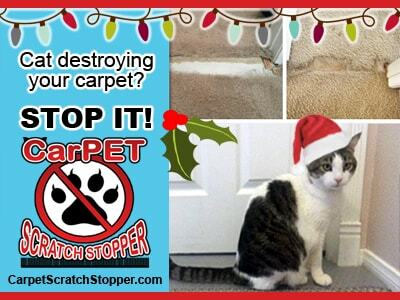 For more information and to purchase, visit http://www.CarPETScratchStopper.com. 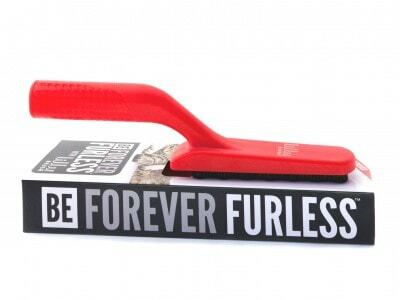 Lilly Brush™ BE FOREVER FURLESS™ efficiently picks up cat hair and household lint with just a few quick sweeps. Use it on home upholstery, cat towers, bedding, autos, clothing, carpets and more- anywhere your furry friend likes to lurk! With your new BFF, you’ll less time vacuuming and more time playing. Oh and by the way, the BFF is 100% reusable so you can kiss those wasteful sticky rollers goodbye! No mess, no waste, no refills! For more information and to purchase, visit http://www.LillyBrush.com. 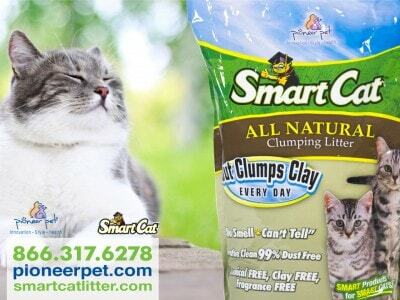 NEW SmartCat All Natural Cat Litter is not only all natural but designed to make everything easier! Easier to carry, easier to scoop and easier to clean. On top of that we are made from 100% USA farmed grass, with no added chemicals or fragrances. Our product will biodegrade after disposal as a renewable resource. We are very soft on paws and can be used for younger cats. For more information and to purchase, visit http://www.PioneerPet.com. Special offer for Conscious Cat readers: Free shipping on litter if ordered from the Pioneer Pet website. Use code NATSHIP at checkout. Offer valid through January 1, 2015. Elderly, bad back, sore knees? Are you tired of bending over and breathing toxic litter dust? This 54 inch long handled all steel constructed kitty litter scoop, powder coated in Hot Pink , with a washable surface, eliminates the need to bend over or get on your knees, stopping you from breathing harmful litter dust. The Stand-N-Scoop is made in the USA and comes with a Life Time Warranty when used as intended. For more information and to purchase, visit http://www.StandNScoop.com. 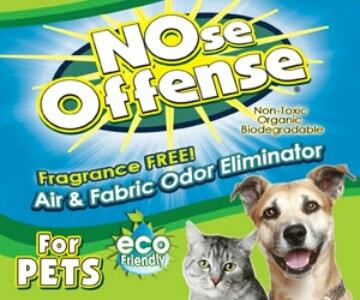 Say NO to all pet odors with NOse Offense For PETS! Put NOse Offense For PETS to work eliminating the pet smells found in the air and embedded in your fabrics. From litter boxes to urine on your carpet or couch, NOse Offense For PETS does for you what no other product can do – effectively eliminate all pet odors in an efficient, safe and environmentally friendly way all while remaining FRAGRANCE-FREE! For more information and to purchase, visit http://www.NOseOffense.com. Exclusive discount for Conscious Cat readers: 15% off all orders, use code 15CONSCIOUS at checkout. Offer valid until December 31, 2014. This holiday season indulge your four legged family member with a warm, wintertime beverage treat! Perfect for chilly days, post-hike hydration, after playing in the snow, or any winter morning (or evening). Helps your pup or kitty feel warm, loved, hydrated and happy in the tummy! 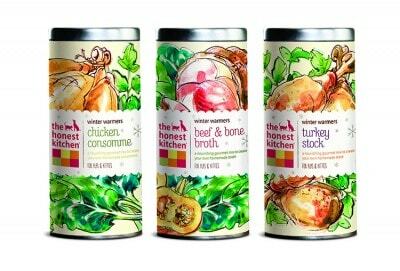 The Honest Kitchen Winter Warmers Broths are made from a mix of human grade, dehydrated ingredients and designed to be blended with hot water before serving. Winter Warmers are sold as a gourmet gift set for $19.99 and include three different broths: Chicken Consommé, Beef & Bone Broth & Turkey Stock. They make great gifts and stocking stuffers for cats and dogs! Limited Time Only – While Supplies Last! For more information and to purchase, visit http://www.TheHonestKitchen.com. Holiday Discount Offer: Save $2 on each Winter Warmers Kit with online promo code BGWW14. Only valid at The Honest Kitchen website. Expires January 31, 2015 or while supplies last. Glacier Point Cat Fountains are the most effective, safest and convenient fountains available. No other fountain has been proven to normalize the water consumed by cats. Glacier Point Fountains can provide cold water which can also be quickly and easily cleaned or even sterilized. The water in a Glacier Point Fountain is toxin free as the made-in-the USA ceramic basins are high fired and non-porous, thereby preventing the buildup of dangerous biofilm. The made-in-the USA nontoxic plastic fittings are a high tech hospital grade component and also contain FDA approved antimicrobials. The company’s goal was to provide the safest, most effective and convenient fountain regardless of the cost of the quality components. This goal has been achieved. 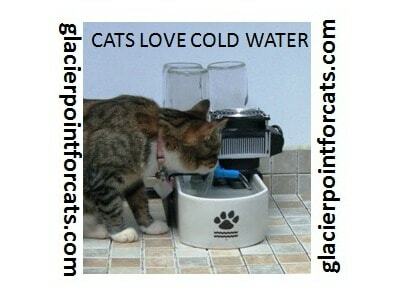 For more information and to purchase, visit http://www.GlacierPointforCats.com. Special gift for Conscious Cat readers: Receive a ceramic food dish with purchase. Offer good through January 1, 2015. Are you looking for the perfect holiday gift for the cat lover in your life? Look no further! 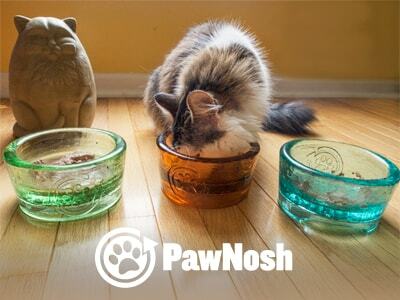 PawNosh recycled glass pet bowls offer a safer and more sustainable alternative to average plastic, ceramic, and metal bowls. Handmade in the USA from non-toxic, 100% recycled glass. Exceedingly durable and forged to last. Each bowl is delivered beautifully gift wrapped, holiday-ready, and warrantied for lifetime of product against breakage. For more information and to purchase, visit http://www.PawNosh.com. Exclusive discount for Conscious Cat readers: Save 11% on all purchases. Use code CCGUIDE14 at checkout. Just Cats Clinic, the only feline exclusive clinic in Reston, Virginia, is proud to offer an environment catered to cats and their people. American Animal Hospital Association (AAHA) accredited and Gold Standard certified from the American Association of Feline Practitioners, the Just Cats Clinic team is dedicated to helping your cat live beyond nine lives. They offer a wide range of services including routine examinations and vaccinations, disease management, diagnostics including lab work, digital radiographs and dental radiographs, dental cleanings and extractions and domestic/international health certificates. Just Cats Clinic also incorporates less invasive treatments like acupuncture and laser therapy. They offer luxury boarding including large condos with floor to ceiling windows to help keep your kitty entertained while you’re away. 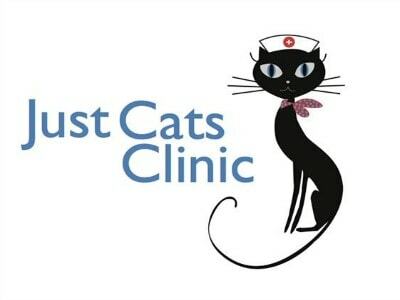 For more information, visit http://www.JustCatsClinic.com. Special discount for Conscious Cat readers: Receive 20% off your first visit. Call 703-520-2702 to schedule an appointment and mention the Conscious Cat. 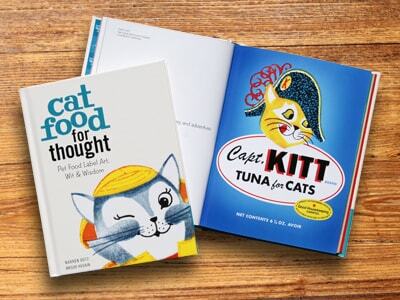 Cat Food for Thought is the perfect holiday gift book and stocking stuffer for the cat lover in your family. It is a petite, beautifully designed, hard-cover book, but also reasonably priced ($9 plus shipping on Amazon). Your family and friends will enjoy the delightful cat food labels as well as the fun and funny, feline-centric quotes and witty words of wisdom. This book is the unique Christmas present for the art-lover, kitty owner, and pop culture lover in your life. Cat Food for Thought is available on Amazon. Personalized and autographed books make wonderful holiday gifts, and I’d be happy to gift wrap and ship directly to the recipient for you. 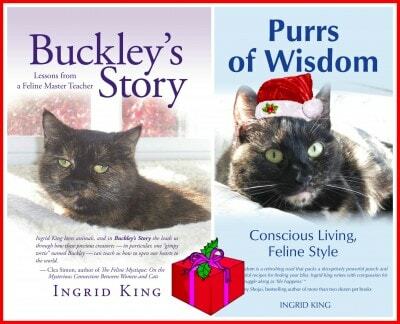 To order a personalized, autographed copy of Buckley’s Story or Purrs of Wisdom, please contact me via email. « The Best Food for Cats: Is There Only One Right Choice? What a fantastic gift giving resource! Thank you very much for putting it together, it must have taken a lot of time, energy and effort to compile. Wow – what a list – going to share this for sure! Wow you are early! We aren’t doing ours quite yet! (If we even completely get it together lol)………I agree with MANY items on this list!